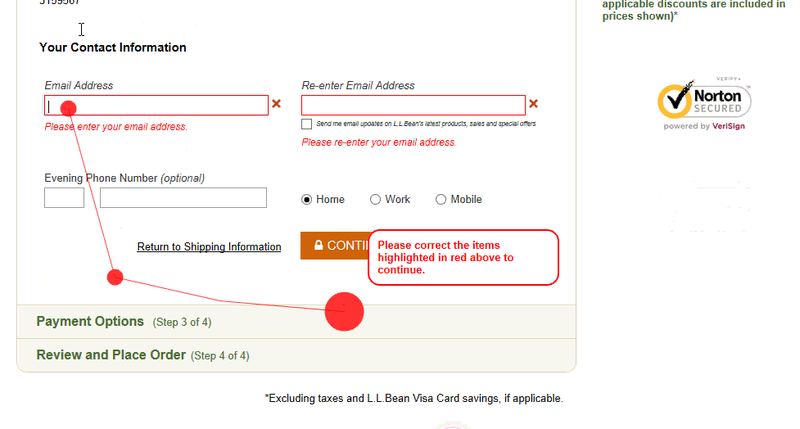 Marking both required and optional fields in the checkout is a controversial area of form usability. This is despite our large-scale Cart & Checkout testing revealing that failing to explicitly mark both required and optional fields leads to unnecessary validation errors, user confusion over which fields they must complete, a slower checkout process, and even abandonments. The issues caused by failing to mark required and optional fields were first observed during our first rounds of checkout usability testing dating back to 2010. Since then this behavior has been reconfirmed during all subsequent checkout usability testing, including our most recent Checkout usability study and our Mobile usability study. Note: the findings shared in this article relate to e-commerce checkout forms and long account creation forms. Other forms, in particular short sign-up and contact forms, don’t seem to be affected anywhere nearly as much by the issues described and may therefore employ alternative designs. 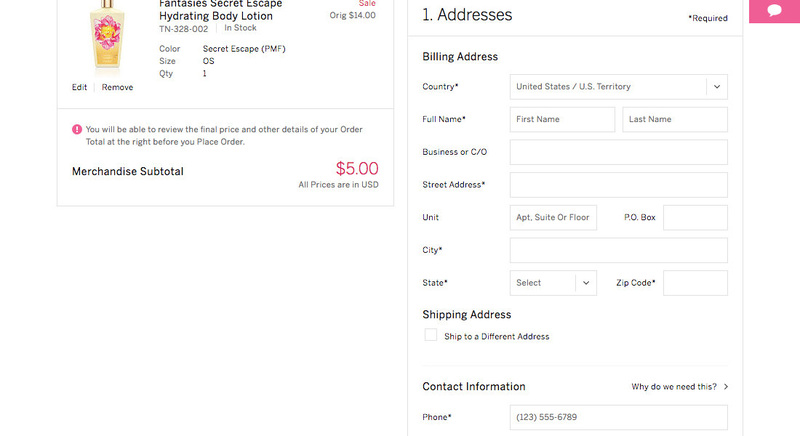 At Victoria’s Secret, as at almost all checkout flows, there are at least a few optional fields for users to consider alongside required fields. When we first published these research findings in 2014, some readers asked if it wouldn’t be easier to simply have only required fields in checkout. While it’s true that’s the ideal case, in the “real world” of e-commerce checkouts optional fields are simply a fact of life — 98% of sites in our benchmark have at least one optional field. 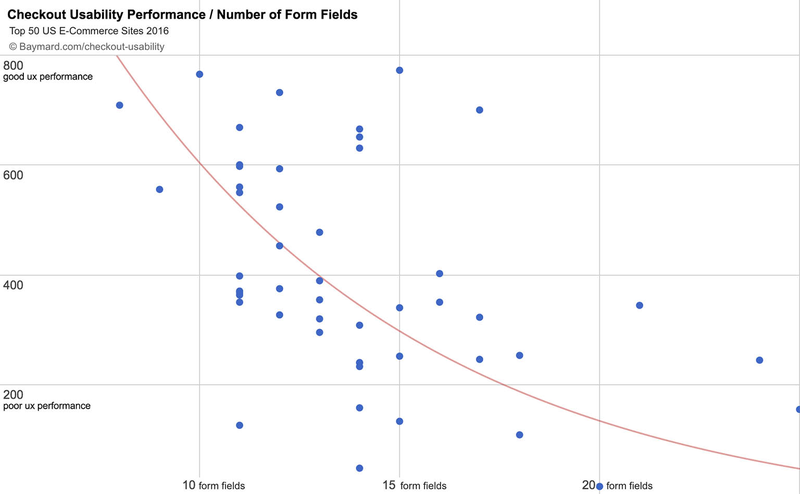 That’s not to say that the amount of form fields can’t be reduced — in fact, we’ve found that most sites have nearly twice as as many form fields as they actually need. Our benchmark reveals that the number of form fields in a checkout is correlated with a site’s overall UX performance — the fewer form fields, the more likely a site will have a good overall UX performance (and vice versa). Therefore, the first evaluation point for all optional inputs should be a close examination of whether the input is truly needed at all. That said, checkout forms aren’t created in a vacuum. While the best course of action for users may be to severely limit or eliminate optional fields, often business interests are given as much (or even more) say in what fields are included in the checkout. 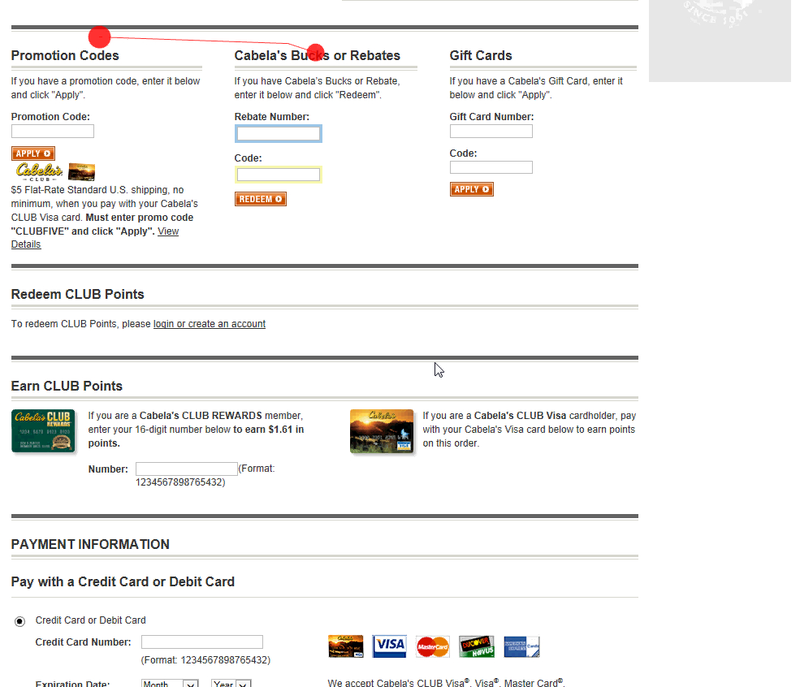 At Cabela’s, 66% of users came to a full stop in completing the payment form when first reaching a massive section of promotional fields. Some never found the credit card fields below and ended up abandoning the purchase. These can include many optional fields depending on the business context — such as newsletters, address type, company name, delivery instructions, title, “Address line 2”, phone, coupon codes, gift certificates, order gifting, order comments, billing address, site-specific features, loyalty programs, PO numbers, etc. The rest of this article will assume that the checkout flow is fully simplified, and any optional form fields are there for a very good reason. Argos has a single generic statement at the top of the page: “Complete all fields unless they say ‘optional’”. Unfortunately, many users during testing overlooked these types of statements and would begin speculating whether some of the required fields were in fact optional. Obvious candidates on this page would be “Title” and “Mobile number”, which could reasonably be optional as not all e-commerce sites require these details. While nearly all sites have optional fields at some point in checkout, many sites will have particular checkout steps where all fields are required. This frequently occurs, for example, at the Payment step, where often all payment fields must be completed. In these instances, one may be tempted to simply indicate at the top of the page that “All fields are required”. However, our testing shows that this doesn’t suffice, as some users inevitably end up overlooking the message. When users fail to notice such “All fields are required” statements, they often begin to question if perhaps some of the fields are optional even at the “Payment” step during checkout, where they obviously know that some of the fields are required. In particular, users often question payment-validation related inputs such as billing phone, cardholder name, and billing zip code. This problem is largely a result of these fields being inconsistently required across different e-commerce sites. Different sites require different types of payment details, so what may be optional on one site is required on another. Note: It bears repeating that these test findings, and hence recommendations, apply to checkout processes and long account creation forms. A 3-field sign-up form may certainly suffice without individually denoting all fields as required. Our benchmark reveals that 37% of sites mark only optional fields. At L.L. Bean, 22% of users during testing tried to proceed without entering their email address for confirmation, as neither this field nor the email field were marked as required. Indeed, it may be tempting to reduce the visual noise in a form by only marking optional fields (or vice versa). However, when encountering forms where only the optional fields were marked, 32% of users during testing had a validation error because they did not complete a required field. As most fields in a form will be required fields, only explicitly marking optional fields has the downside of it being relatively difficult to see which fields are optional. If only marking optional field types many users no longer look at each individual form field as an individual task. 44% of users came to a complete stop when reaching the last section of the shipping address form at Amazon, where only optional fields were marked. 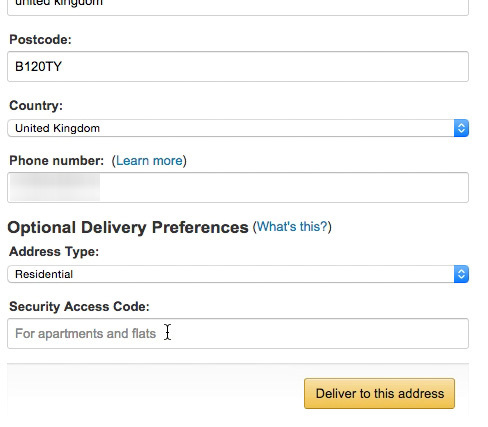 Users were unsure if the fields were required or optional (despite the header “Optional Delivery Preferences”). As one user said, “Access code? Do they have that? Do you need something for the door in the UK? Is it something that I have to make up, or…? I’d call him [UK-based friend for whom the user was purchasing the item] and ask what it means”. Users looking elsewhere in the form to deduce for themselves what a nonmarked field might mean will only have relatively few optional fields to help them detect the pattern for how fields are marked. This is particularly problematic for information that some users will be reluctant to provide, like their phone number or date of birth, as they will simply leave these required fields blank. Is the phone number field required? When a field is unmarked some users will have to guess to figure out whether an unmarked field is required or optional. This is especially problematic on mobile, where users have little page overview. In short: not marking required fields as “Required” or with an asterisk has been consistently observed to lead to an increase in form completion time and a high rate of needless validation errors. Our benchmark reveals that 42% of sites mark only required fields. It should be noted that forms where the required fields were marked and the optional fields were not did fare better in testing when it came to decreasing the rate of needless validation errors, compared to when only optional fields were marked. 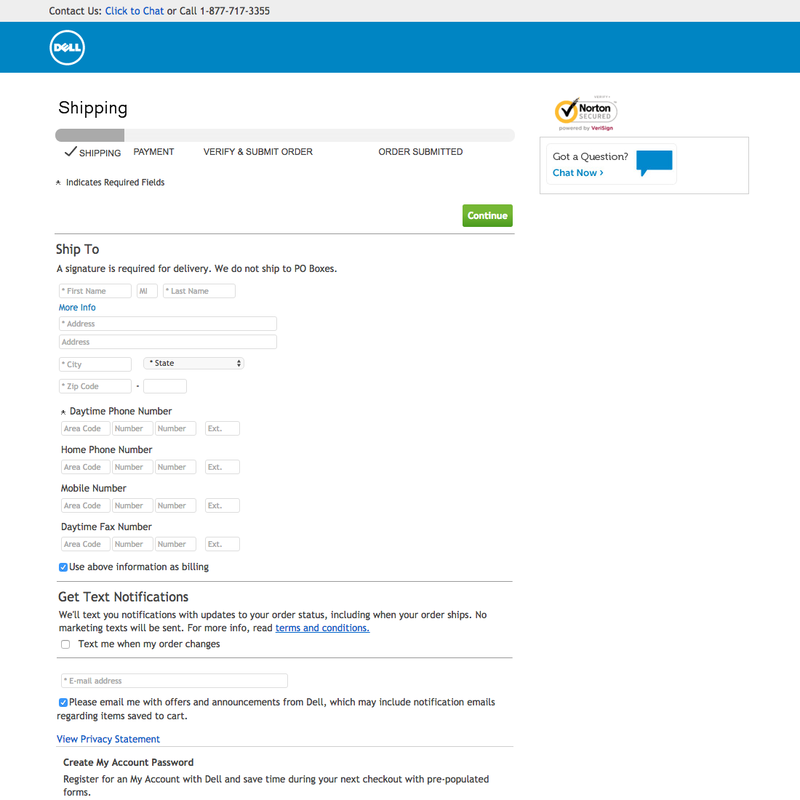 At Dell only required fields are marked. Users must determine for themselves whether all phone and fax numbers are required, only some are, or all are optional. 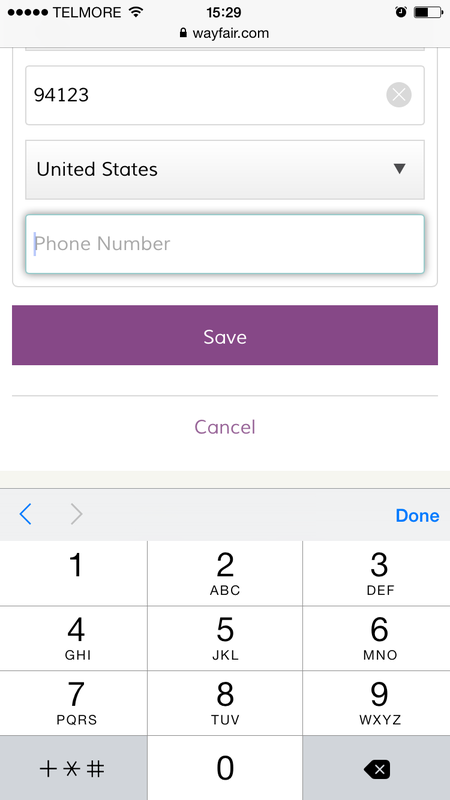 This implementation is made more confusing by indicating which fields are required with an asterisk as part of the placeholder text for most fields, then for the “Daytime Phone Number” field using an asterisk next to the field label. Users who assume a fax number is required, and who don’t have one, may abandon, assuming they can’t complete the checkout. However, when testing forms where only required fields were marked, the completion rate of an optional phone number field was almost identical to sites where it was required — for example, 86% of users completed an optional but unmarked phone number field at one test site (AllPosters), while 89% of users completed a clearly marked phone number field at another (L.L. Bean). Our 2017 survey of 2,020 US adults finds that 35% would never give out their date of birth, 15% would never get out their phone number, and 11% would never disclose their gender. This has implications for users who think, for example, an optional phone number field is in fact required, because the field hasn’t been explicitly marked, and who therefore abandon due to privacy concerns. This may have larger implications, where users may feel pressured into providing information they’d rather not disclose. 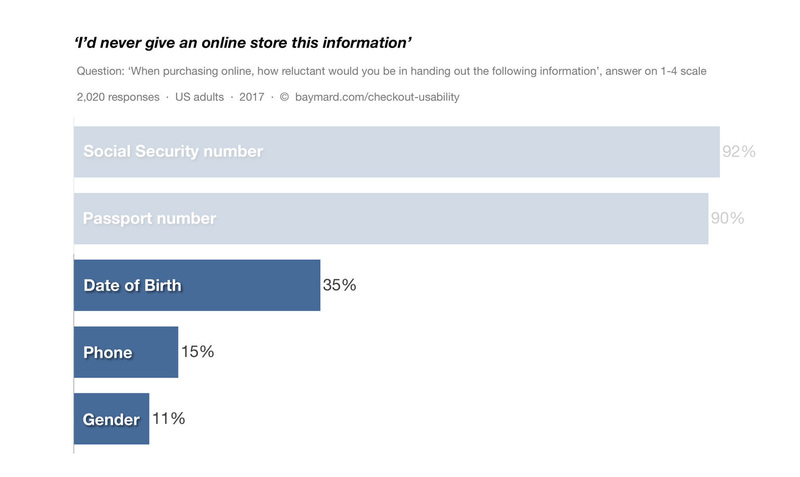 As privacy is a common reason for checkout abandonments, the implications of just a few users making such misinterpretations can often be read directly in the checkout abandonment stats. Even more severely, we also observed that on sites that only mark the required fields, a smaller group of subjects completely mistook optional fields as being required (particularly when testing mobile sites). This can have dire consequences as these users will start to hunt for more information on the cryptic field they have misinterpreted as being required. If the matter remains unresolved, the typical consequence is either bogus information submitted or site abandonments. 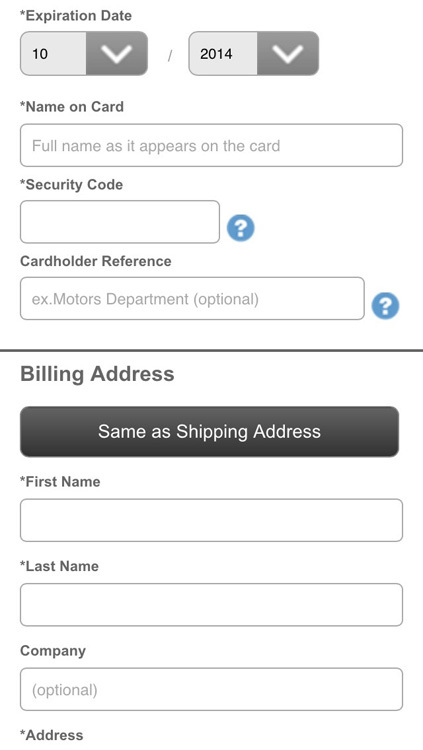 Furthermore, it’s often difficult for users to determine whether fields such as phone, title, email, billing zip code (for credit card), card security code (CVV), issuing bank, and cardholder name are required or optional if only required fields are marked, as these fields are highly inconsistent across e-commerce sites when it comes to being required or optional. Not marking both optional and required fields makes it difficult for users to approach each form field as a separate task to either complete or skip. Consequently, users are much more likely to get bogged down in the form and (1) come to a complete stop and go backwards in the form to see what other fields have been marked as, or (2) guess what an unmarked field means and, therefore, encounter validation errors, leave important fields blank, or abandon out of frustration or confusion. Therefore, rather than only marking optional fields, or only marking required fields (or, even worse, not marking any fields), both required and optional fields should be explicitly marked. At Microsoft required fields are denoted with asterisks and optional fields with “(Optional)”. It’s extremely clear to users glancing at the form as a whole, as well as at the individual field level, which fields are required and which are optional. Note, however, that “Address Line 2” should ideally be hidden behind a link. Explicitly marking both required and optional fields provides users the information they need to quickly move through a form. By explicitly denoting both optional and required fields, users aren’t forced to infer anything and don’t have to look backwards at prior form fields — but can instead stay focused on just the one form field they are filling out. Users are consequently able to progress more seamlessly through the entire form, field by field, as they don’t have to backtrack and scan previous fields to make sure they haven’t skipped a required field or filled out an optional field they on second thought prefer not to. During testing it was also verified that using an asterisk was sufficient to indicate required fields when used on steps where the optional fields were marked as “Optional” after or close to the field label. Note, however, that many of the commonly optional form fields are better to collapse entirely behind a link (e.g., “Address Line 2”, which during testing was verified to act as sufficient indicator of the input being optional. Throughout all our testing we find many sites have misconceptions of the amount of knowledge users are bringing to their checkout processes. While it might seem obvious to site designers that, for example, the phone field isn’t required on their site, but all the other payment fields are, this will by no means be obvious to the average user (because in fact of 87% sites do require phone number during checkout). Users simply have no way to “intuitively know” a particular site’s information requirements beforehand. They need to figure it out on a site-by-site basis for each and every form they fill out. This is why it’s necessary to indicate which fields are required and which aren’t — so users don’t have to deduce it themselves. By explicitly marking both optional and required fields — as seen here on Grainger’s mobile site — users can focus on completing each field individually without having to scroll and deduce the nature of each field based on how other fields are, or aren’t, marked. Note, however, that ideally “Optional” should be placed adjacent to the field label (not as placeholder text). The issue is even more pronounced on mobile, where 75% of users during testing experienced severe form usability issues on sites that failed to mark both required and optional fields clearly. Users on mobile must make do with a much smaller interface, where getting an overview is always difficult, especially for long or complex forms, and other issues are common as well (e.g., difficulty typing, external interruptions such as texts and phone calls, etc.). It’s therefore equally if not more important to mark optional and required fields in mobile checkouts. And yet only 14% explicitly mark both required and optional fields on desktop, and only 6% do on mobile. Authored by Edward Scott. Published on October 2, 2018. We first published an article on the topic of “Required and optional form fields” in December of 2014. This article has been rewritten entirely with our newest usability test findings. Very interesting — and controversial! — as the vast majority of sites seem to mark one and not the other. But I, for one, will be willing to move away from this de facto standard, provided there’s sufficient evidence for doing so. I’ve been watching folks fill out long and complex forms for years, and 99% of the time they just fill out everything UNLESS they are uncomfortable or unable to provide a piece of info (what I’ll call “challenging questions”). You’re absolutely right that error aversion is very strong (and well learned, unfortunately). Would you say the majority of the difficulties you observed arose around such “challenging” questions, rather than form content generally. I ask because while I agree that clarity is paramount, we’re going to be adding considerable visual and cognitive noise having an indicator on every field. On mobile we’ll also have problems of space. Is it possible the best solution is to a) eliminate unnecessary challenging questions and b) mark the remaining challenging questions as optional/explain why the info is needed (to assuage privacy concerns)? Finally, with how many people did you test the 9 sites which mark both, and did any of them react negatively to this approach? The key insight here is that if you don’t mark both required and optional fields, the user can’t focus on just the field they are currently filling out – they need to take the surrounding context into account. Depending on how it is done (i.e. only denoting optional fields vs only marking required ones) and the context in which it occurs (e.g. desktop vs mobile), this introduce a light-to-heavy mental tax on the user – a tax which can be avoided simply by adding a single-word ‘Optional’ / ‘Required’ tag alongside each field’s label. Of course from a user POV it is generally preferred to have as few questions as possible asked, so yes, if some fields are deemed unnecessary, do remove them. But this is obviously a business consideration too – maybe certain customer info has great value for customer service or for marketing. Similarly, there may be certain info some customers will happy give if they are simply assured of proper usage. Phone is a great example where if you can promise it will only be used in case of delivery issues, then some users will happily give it up – yet the field should obviously remain optional. So the best solution is to remove unnecessary form fields and then add proper explanations for the few optional fields that are deemed sufficiently valuable to be included. We’ve conducted in-lab tests of checkouts with 63 participants (in separate think-aloud and eye-tracking studies) across roughly 20 sites. Some of them are among the 9 sites which mark both, but not all of them (note: those nine sites are from our benchmark study). I am questioning whether that is in fact the key insight from the research, or whether the key insight is that challenging questions need to be marked. Totally agree with you that users are wanting to know, /at the field/ whether it is required. But my hypothesis is that they only want to know for challenging questions, not all questions in general. If that’s the case, then we can reduce visual and cognitive noise, while still having a seamless experience, if on the challenging questions we either mark “optional” or explain why information needed. I agree completely with your second para. Thanks for the clarification around numbers. How many sessions did you run where both were marked? And in how many of those sessions did the participant react negatively to both being marked? I’m not entirely sure I understand the definition of “challenging questions”? I should point out that, as we note throughout the article, these insights are related specifically to checkouts and long account creation forms. We haven’t tested surveys etc so I can’t say if the findings hold true in that context. However, only denoting some fields (i.e. ‘challenging questions’) with a ‘required’ label but not other fields (even though they are required too), would make for a fairly inconsistent denotation of the fields and I would therefore think this would confuse users, but we haven’t tested the approach so I obviously can’t say for sure. I also really appreciate the dialogue! When I say “challenging questions”, I mean questions that people are uncomfortable or unable to answer. I think we can usually identify these, especially if the form is tested before go live. - adding reassuring/explanatory text to challenging question that are required. This achieves lowest visual and cognitive noise (remember every extra visual element has to be processed by the brain, even if not consciously) while still communicating which questions are optional and which are required. It does, however, rely on my — not yet formally tested — hypothesis that people only look to see if the question is required if it is challenging. Certainly my anecdotal evidence from testing supports it – would yours? I do get what you’re saying about not necessarily being more widely applicable than the sorts of forms you were testing. I must confess I initially misread “and long sign-up forms” as just “long forms”, and it’s that situation where I think the visual noise of marking both really becomes oppressive. Leads me to another hypothesis, though, which is that checkout and long sign-up forms may be cases where people are particularly reluctant to give more information than needed, and thus more proactive about knowing what’s required and what’s not. Mostly I test long, complex administrative forms, not checkout/sign-up forms, so that could be a reason why we may be seeing different things. I normally agree with 98% of what you guys have to say. I would say that I do disagree that marking both is unnecessary. I have seen that simply marking optional fields has not proven troublesome. I would need more than anecdotal data for a conclusion that both need to be marked. It’s absolutely true that only marking one type won’t cause trouble for all users – indeed, as mentioned in the article, most users are perfectly capable of deducing which fields are required and optional from the one denoted type. Alas, there’s a difference between being able to do something and having a smooth, seamless experience when doing it. Our study finds that it taints the experience of at least some users. In our studies it happened to be quite a lot but obviously your mileage may vary. Steve Krug said: don’t make me think. Guessing which system a website has chosen is thinking. We no like thinking. Thinking bad. I’m sure some graphic designers have complained about clear labels and straightforward instructions and text being too large. But they are not the customer, and they are not the ones being asked to think. Telephone numbers are a big one, especially among people who cannot use them due to things like physical disability. You’re already getting our email address, why do you insist on calling us on the telephone? I think Luke W, would disagree! Could I please clarify something in the testing structure. and notice that when both are marked speed and accuracy was better. Or did you test sites that had mandatory marked and optional marked and conclude that both would be better? Yes, all three design approaches were tested. I think the entire premise is wrong. If you want a good UX, then don’t have optional fields. Limit the form to only things required to complete the requested result. Complete the purchase transaction with the least possible cognitive load. Don’t do market research in that moment. As UX designers, it’s our job to convince ‘business’ that we know better than they do in this sphere. Designing experiences that meet business goals but don’t create a sense of joy, of pleasure, of comfort in users should not be the concern of User Experience designers; perhaps the concern of ‘Business Objective’ designers, but since that’s not what I do, can’t really say. You cite the ‘Phone’ field as a good example of something (not required that could still be important, if I’m reading between the lines) which argues for the clear exposition of the importance of each field. I would argue a different way. 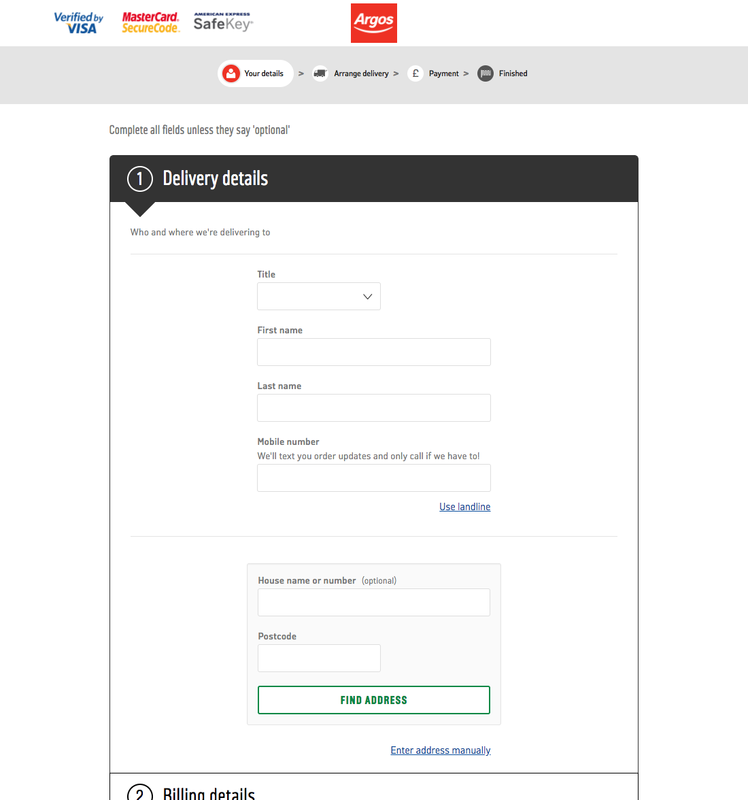 Imagine I’m the user; I’m attempting to order something from your company via your site. The simple fact that I’ve chosen to engage your site, and spend money, should tell you something about how confident I am that you’ll meet or exceed my needs. Do you believe my confidence increases when you essentially ask the question “Hey, just in case something goes wrong here, do you OPTIONALLY want to give me your phone number?”. I don’t. I believe that, as a business, you should either know for a fact that nothing will go wrong (unlikely), or specifically acknowledge that things occasionally go wrong. And you know what? Some things don’t require a call. Some things can be handled by email. Our job as UX Designers is to make those distinctions, and lobby for the user. I appreciate the apparent intent of this article, but I think as UX-ers, we really need to stop this ‘Business reasons…’ argument from propagating further. If ‘Business reasons’ were what motivated the user, we wouldn’t be needed at all. I think we fundamentally agree that unnecessary fields should be removed, and it is certainly the UX designer’s job to lobby heavily for this. On this we agree. Now, in the ideal UX world, that would mean no unnecessary fields ever existed in a web form. In practice, however, the UX designer doesn’t always get the final word and business needs are often part of the design decision. What we’re interested in exploring here is how we can create the best user experience in that environment – a context which takes business considerations into account. “Designing experiences that meet business goals” and creates (at the very least) “comfort in users”. UX designers shouldn’t isolate themselves from other disciplines and departments of the business (incl. the business-side of things), they should work together with them – obviously arguing the best case they can for great UX, and then – once all deliberations have been done and the decisions have been made – go ahead and create the best possible solution under whatever constraints there might be. Re: Phone field. I think we’ll have to agree to disagree. As you say, sometimes you can simply do with an e-mail. Yet as you also argue, obviously a phone will be useful for urgent matters. Both are valid arguments – so should you remove the field completely or force users to submit the information? I’d argue that there are some cases (not all, but certainly some) where asking for the information but not requiring users to submit it is valid. E.g. perhaps some users would like order updates sent by text message rather than e-mail. I think our disagreement is one of degree. Obviously, there should be legitimate reasons for including any field, otherwise they should absolutely be removed rather than made optional. We complete agree on this. I don’t, however, find that it is a completely black-and-white “necessary/unnecessary” matter – I think there exists a gray area in-between those two ends, which is where optional fields enter the equation. Likewise, I appreciate your nuanced discussion, and you are completely correct: it’s not a binary situation. I sometimes like being dogmatic and binary about an issue because it can be a useful lens to evaluate where the nuance really lies. In the phone example, it could be argued that the initial form only include the required items; then, on the confirmation page, surface some clearly marked optional fields, where we could pose the question of text vs. phone etc. for further communication. Thanks again for the discussion, and the article. I agree with a lot of what both of you are saying, and would add that you need to cater for an additional situation: if the user has X, then they have to provide it to the business, but it’s valid for the user not to have X. Phone (and email) is a great example of this. If the customer has a phone number, the business may need it so they can contact them if the email bounces etc. But both the business and the customer may not want the customer to be excluded just because they don’t have a phone number. In this case, phone number should stay in the form, there should be a tip explaining how it will be used, and the field should be optional. Throughout the article we clearly state that these research findings are for checkout processes and long account creation forms. Indeed, this is even stated in the article title. Thanks as usual. I think this isn’t as black and white as is made out within the article. Let me explain why. Taking the salient insight here of “both optional and required form fields should be indicated” the recommendation is to, simply put, “add one word (‘optional’ or ‘required’) next to each field”. d) maybe this is just a design element in the example you gave – but because optional isn’t a stand out element from required or visa-versa, they look exactly the same and therefore non-differentiating. Contextually, I think there are still issues. I’m not debating the point at all, just the implemented or recommended solution. Adversely, then again, if you were to place “optional” and an “*” you are almost comparing apples and pears to a word mixed with a symbol that users have to associate to an action. As Jessica says – it’s controversial. Hi David, thank you for the comment. a) there’s a big difference between a universal page disclaimer at the top of the page and one on a field level. By having it for each field users are allowed to focus on one field at a time (as they fill it), with a single universal disclaimer they have to read the page like a book (which they of course don’t). c) agree that the user’s initial scan of the checkout step might be worse off when both field types are required, but again during all three different large-scale checkout studies, the sites which marked both, proved to provide the user a much more clear form filling experience (allowing them to focus on each field individually). d) agree that this might apply when users were scanning the checkout step as a whole, but we did not observe it as they were filling each field individually. It highly depends on users the website is targeting, some are very web savvy, others might not be. I think everyone should use some approach as a starting point, and test alternatives. Hi Damir, thanks for pointing to the Voluntary Over Disclosure study. The post at UXmovement rely on a good research study by Preibusch et. al. on “voluntary over disclosure effect in some web forms”. The only issue with the UXmovement article is that it assumes the findings in Preibusch’s study apply for all types of online forms. In Preibusch study users are unlikely to be anxious of getting form errors due to the open-style inputs tested (whereas checkout forms have data that require inputs following strict inputs). In Preibusch’s study “we did not perform any input validation” thus there were no possibility for a subsequent error experience (e.g. for those users not filling a required field) – and the negative impact such error experiences may have on conversions in a real life checkout process is a factor not included. In Preibusch’s study users aren’t in a purchase context, and therefor unlike to anxious about sending an order with invalid data, etc. In Preibusch’s study a synthetic form were tested, i.e. there’s no surrounding graphics and elements to distract and dilute field attention. This is not a critique of Preibusch’s study (or of you for bringing this up) – but a note of caution about the article at UXMovement which imply the findings are applicable to online checkout forms, without mentioning the constraints of the underlying study. The Preibusch study can teach us a lot about other types of web forms – it’s just not directly applicable to checkout forms. We implemented “E-Commerce Checkout Usability” guide for all our stores and saw doubling of checkout conversion rates. We will soon work on implementation of other usability guidelines. Thank you Christian and Jamie for your excellent work! I agree with many of the others on here, that indicating both optional & required is a lot of visual noise for the user. In addition to error states, and contextual help, the user may not be able to see the forest for the trees. I think the most important data point was missing from your study; what effect does required, optional, and required & optional, have on form conversion? Obviously late to the party but I didn’t see any reference to ADA compliance which would seem to limit the presentation options. Were the variations each tested on the same forms, or were the results inferred from tests using forms that just so happened to use the various strategies? If the latter, I’d suggest that forms using the “mark each input” strategy might be generally better-designed, skewing the test results. We tested and subsequently re-tested these different design combinations in very high volumes across more than 30 checkout forms. Also on sites that have “perfect” form field design (perfect styling, labels, visual clutter) – apart from missing the denotation of both required and optional form fields. These original test findings were once again confirmed in our latest large-scale checkout testing – those latest findings are available in Baymard Premium. We might at some point do a free followup article showing the re-verified findings given the high interest and the seeming general “controversy” this topic is apparently causing. The followup article is now published/overwritten the original one. Very interesting indeed! Curious to know if when using the asterisk (whether alone, or in combination with optional), where there any issues with missing the asterisk as a whole? Did forms with red/orange asterisk perform better than the ones with the asterisk that is the same color as the text label? Some forms have them as red, some as black. Thanks for a great article and for testing this thoroughly. 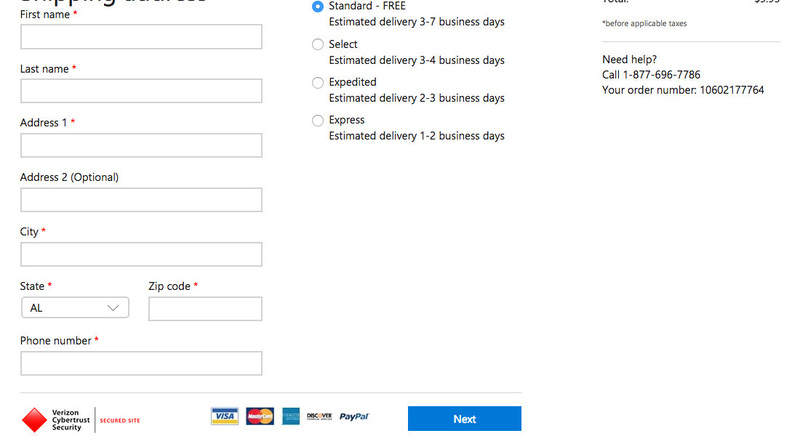 I personally feel that indicating both types of fields are a bit redundant in an eCommerce checkout scenario (as opposed to an online questionnaire or lead gen form for example). In eCommerce it should be assumed that all fields are mandatory unless otherwise stated, and optional fields should be kept at a minimum since the main goal is to get people to convert after all. Limiting the amount of actions a customer has to take to complete the purchase should be the highest priority. One alternative worth considering is to ask for optional information on the order confirmation page after the order has been placed, but most eCommerce platforms do not support this type of functionality without custom development. We agree, most resources should be spent on optimizing the checkout so only the truly needed for fields are there. For most sites this means a lot of optional fields can be removed. Further, as stated in the first section of this article “Why Optional Fields Are Part of Almost Every Checkout” most sites still have 1-3 optional form fields they can’t easily get rid of.